This is very much all three. The simulator is in effect an or cooperate. I am sure there will be some resistance from empty computer without the models and scenarios built by some. Not all stakeholders have to be open from the start and the schools or manufacturers. To enable and build a compre- we have to remember that an airplane takes off up wind. We hensive community we will facilitate the sharing and learning are providing an ecosystem to remove the insanity, which is of more complex scenarios and models. This will provide for in effect making changes so we do not have the same attitude more advanced training over and above the standard STCW and environment. There is absolutely no reason why the ship types up 6 copies the issue is central to what THESIS and the ‘ecosystem’ of a crew list, 4 copies of inventory and bond, etc. All of this can solve. But, how? The master is responsible, whether the shore puts pressure should and could be done ashore and connected to the ship and the port and the agent, without the master being the secretary on or not. In fact, the shore pressure is there, the added work or being involved. There are endless examples of paperwork load is there, the criminalization is there, the single point of that should be done from ashore, or where the automation of failure is under greater pressure, so why not relieve the pres- sure. Allow the decision to be shared, or at least the tools to be log books, data and engine performance could be done with- in place to share the discussion and share the thought process, out making this a manual task. A connected ship would enable without just underhand pressure from ashore. Share the same the menial tasks to be done by a team ashore. decision tools, and then allow it to be a ? eet resource decision. De? 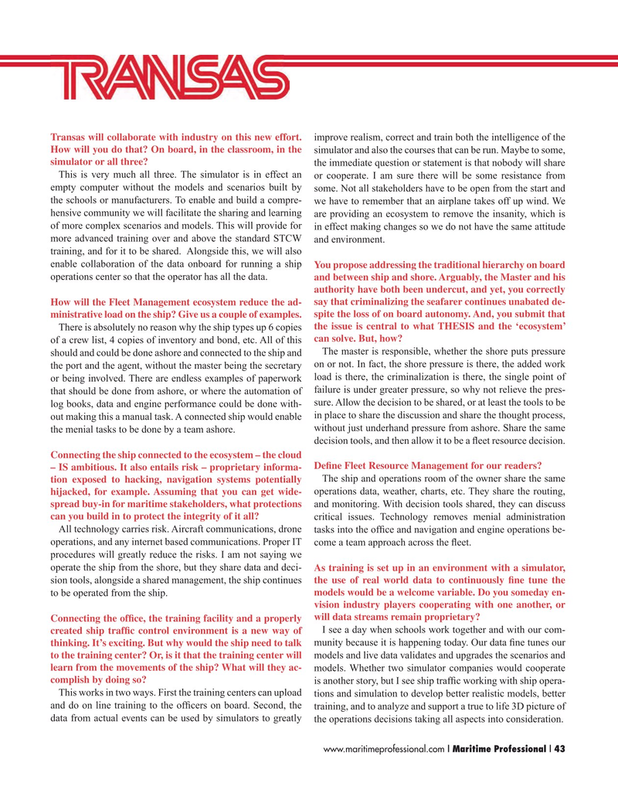 ne Fleet Resource Management for our readers? All technology carries risk. Aircraft communications, drone tasks into the of? ce and navigation and engine operations be- operations, and any internet based communications. Proper IT come a team approach across the ? eet. Connecting the of? ce, the training facility and a properly will data streams remain proprietary? This works in two ways. First the training centers can upload tions and simulation to develop better realistic models, better and do on line training to the of? cers on board. Second, the training, and to analyze and support a true to life 3D picture of data from actual events can be used by simulators to greatly the operations decisions taking all aspects into consideration.